If you are thinking of taking up piano or are returning to it after a break, it is a good idea to have one-to-one lessons. For beginners it is much easier to pick up the basics from a teacher and for lapsed players any bad habits that have developed with time are best corrected at an early stage. We have a dedicated teaching room within our showrooms where Sally Carpender, a very experienced teacher, offers lessons for all types of pupil from beginner through to post grade 8 level. Below is Sally’s short biography. To find out more visit her website: www.sally-carpender-piano.co.uk. “I was educated at the Arts Educational School, Tring Park, where I studied Dance Drama and Music. After leaving school I continued my musical training locally. 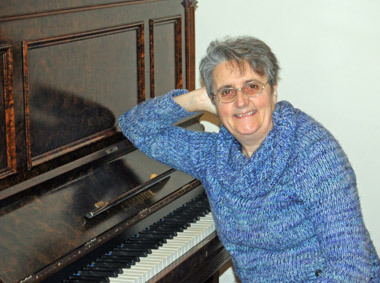 I taught Piano and Dance in Aylesbury then returned to my old school to work as a Pianist prior to moving to Cornwall, where I taught Piano in a number of different schools over the past 30 years. My pupils ranged from beginners to post Grade 8 , with many pupils from overseas. I also played for Truro High School Prep and Senior Choirs. The Prep choir were semi-finalists in Songs of Praise Junior Choir of the Year in 2013 and the Senior Choir , under the Direction of Frances Eagar travelled abroad with Concert tours , where I can say I have played all over Europe, New York, Hong Kong and South Africa. At present I teach privately and at Vinehall School, Robertsbridge . I also work as a freelance dance pianist at RAD, Battersea; Laine Theatre Arts, Epsom and various dance schools throughout the South east of England.